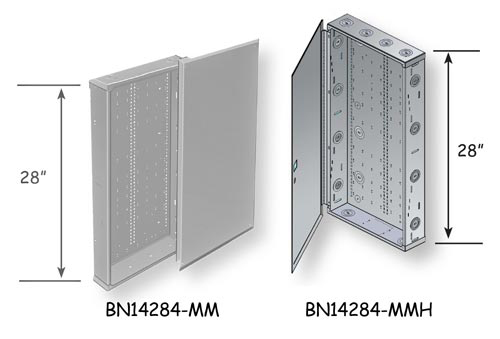 Specification: BN14284-MM (Door/Lid) and BN14104-MMH (Hinged Door) Low Voltage Enclosure Structured Wiring and Indoor Service Cabinet 14-1/4″ Wide x 28″ Tall x 4″ Deep Weight: 17 lbs. This enclosure is made of a 18-gauge fabricated steel lid and a 20-gauge fabricated steel body. Both are powder coated with a white finish. The finished box is completely enclosed with knockouts on the top and bottom to the inside of the finished wall and a door/lid that is fastened with 4 zinc-coated Phillips sheet metal screws. The interior back features a universal mounting pattern that accepts most major brands of communication modules. The BN14284 is UL listed (UL1863). The enclosure mounts prior to drywall between 16″ center studs using depth marks on the side of the body. This interior, flush- mount enclosure is specifically designed as a home-run point for communication, data and/or cable audio/video feeds.